Is anyone else having a weird winter? We haven’t had much snow like we normally do, but it’s been eerily foggy. Every night the fog rolls in after it gets dark and I swear its the beginning of a scary movie. Alas, I live to see another day, and another week of bullet journaling. I ended up taking out my food and water trackers this week. I really need to come to the realization that I just don’t need them. I don’t want to draw them in my bullet journal just for the sake of having them in there. 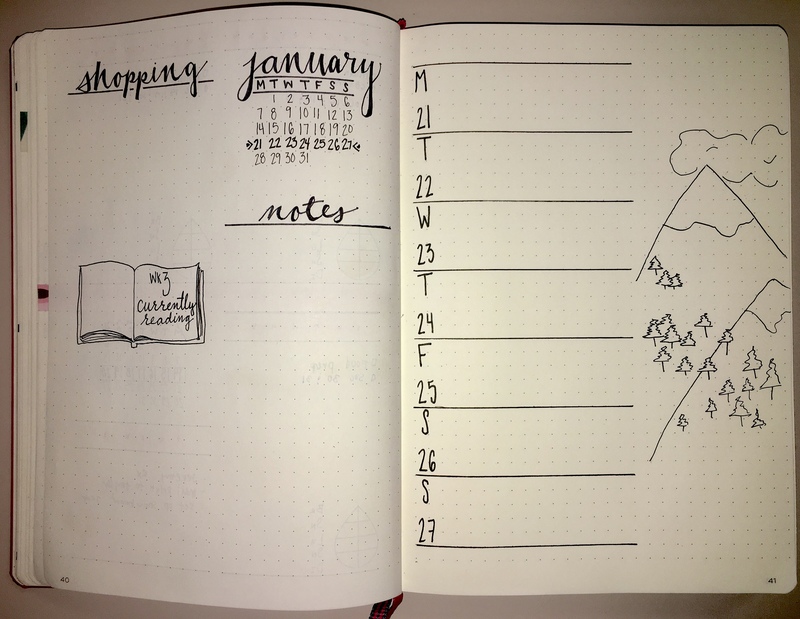 I could have left my right page a full spread of just dailies, but knew I wouldn’t actually use that much space, so I used the negative space to doodle some mountains. Sometimes I just need a doodle in my life. Lately I’ve been wanting to head up to the mountains to go snowboarding, but it’s all about getting the right day for me.